To Germany, it seemed like Britain and France were taking over huge sections of the Earth by force. Britain and France had established colonies in Africa, the Middle East, Asia, Central America, and had taken over most of the Caribbean islands. To protect themselves, Germany, Italy, and Austria-Hungary signed a secret treaty. This treaty was defensive. Basically, they agreed if someone attacks you, we'll help. History refers to this group (in red on the map below) as the Triple Alliance. Britain, France, and Russia also agreed to help each other by secret treaty. History refers to this group (in blue on the map below) as the Triple Entente. There was a small country in the Balkan region of Europe in 1914 called Serbia (in brown on the map, right under Austria-Hungary. and below in gray to the west of Bosnia.) Serbia had gained independence from the Ottoman Empire. But many Serbs were still in Bosnia and Herzegovina. 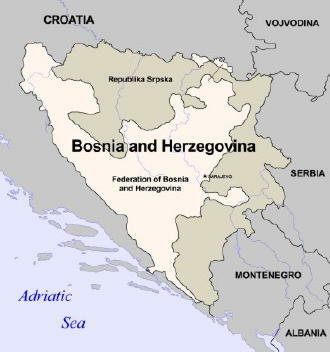 Like Serbia, Bosnia and Herzegovina were once part of the Ottoman Empire, but were annexed by Austria-Hungary in 1908. The Serbs in this region wanted the region to become part of the newly independent Serbia. But Austria-Hungary would not allow this. They did, however, allow the Bosnian people to elect a parliament, but this parliament had no real power. Anything this parliament decided could be overruled or vetoed by government officials in Vienna or Budapest (Austria-Hungary.) This infuriated Serbian nationals in Bosnia. By 1914, there was great unrest in the region. June 1914, the Archduke of Austria, heir to the throne of Austria-Hungary, and his wife, visited Bosnia to inspect Austrian troops stationed there. While they were traveling, someone threw a bomb at their car. It rolled off the back of the car and injured an Austrian officer and some bystanders. Later, the archduke and his wife rode in their limousine, this time with more guards and in procession, to visit the injured officer. But their car took a wrong turn. There was a young Serbian national, a teenager, loitering on the sidewalk. He recognized the archduke. This young man had a gun. He shot the archduke and his wife, who later died of these wounds. He tried to turn his gun on himself, but bystanders jumped him and prevented this. There is no evidence that the government of Serbia assisted in this assassination. But, Austria-Hungary wanted to use this assassination as an excuse to attack Serbia to add Serbia under Austria-Hungary control. They waited until they received assurance from Germany that if Russia stepped up to protect Serbia, possibly bringing her allies Great Britain and France with her, that Germany would step in to help Austria-Hungary. Less than a month later, after receiving assurance from Germany that they would assist her, Austria-Hungary declared war on Serbia. As expected, Russia stepped in. By August 1914, France and Great Britain had joined Russia in a war against Germany and Austria-Hungry. Peace between the great powers of Europe had come to an end. The Great War had begun. The Central Powers: Germany and Austria-Hungary were joined by Turkey and Bulgaria. The Allies: Britain, France, and Russia were joined by Greece, Portugal, Romania, Serbia, Italy, Japan, and Northern Africa including Morocco, Algeria, Libya, Egypt, and later in 1917 by the United States. Some of the countries that remained neutral included Denmark, Sweden, Norway, the Netherlands, Spain, Albania, Switzerland. You might think that a series of secret treaties was the reason the great powers of Europe went to war. Certainly, the treaties contributed. But what actually caused the Great War was money. Germany was an industrial country. Nearly all the countries in Europe were industrial countries. Britain could sell their goods to their colonies. Britain controlled India. That was really the only colony they needed. They could sell all their goods there. Britain also controlled a huge portion of Africa and had other colonies in the Caribbean. France also had many colonies. Both Britain and France did not allow other countries to freely trade with their colonies without their permission. Germany needed an international marketplace to maintain their economy. Germany had almost no colonies. By 1914, the once great empire of Austria-Hungary had almost no colonies. Germany and Austria-Hungary needed a place to sell their goods. Britain and France was making it difficult for them to do that. It's no coincidence that when US President Wilson presented his 14 Point Plan to Congress, as a blueprint for world peace at the end of World War I, among first points he listed were two new international laws. One law eliminated secret treaties forever. The other established for all time freedom of trade across borders. Unfortunately, these laws were not built into the Treaty of Versailles, the treaty that ended WWI. Why was the death toll so high in World War I? What were the effects and outcome of World War I?